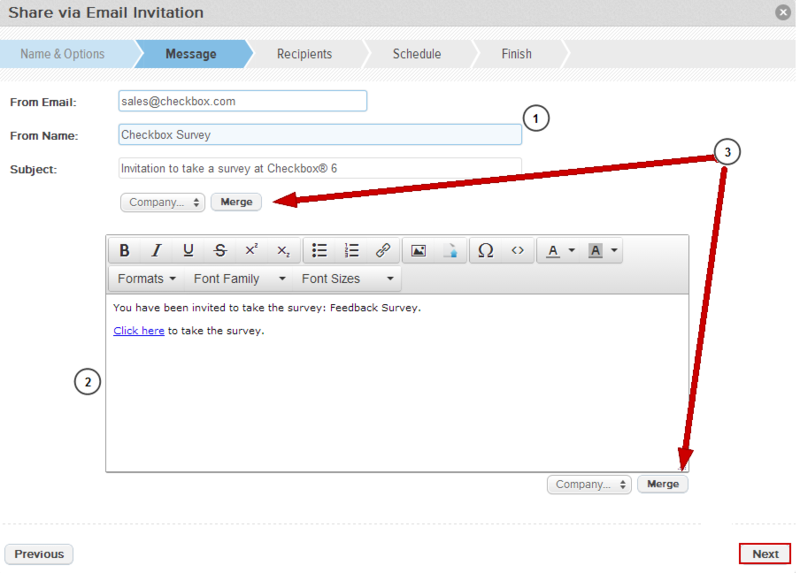 This guide will walk you through how to send your surveys using Checkbox Email Invitations. 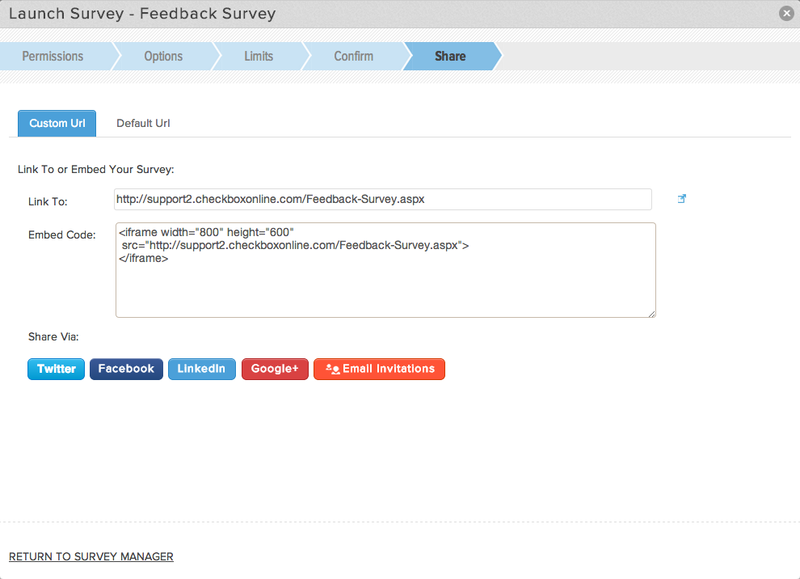 You are welcome to use your own email to send your survey or post your survey link on your website or to social media sites if you’d prefer, but Checkbox Invitations gives you the added benefit of tracking responses and user status and automatically sending reminders. If you are going to send your invitation to registered Checkbox users (i.e. require people to be logged in to take your survey) or a saved Email List, you will want to make sure your Users or Email List(s) are set up in the User Manager first before you start creating your invitation.For more details on how to create new users in Checkbox, please see our User Import Guide. 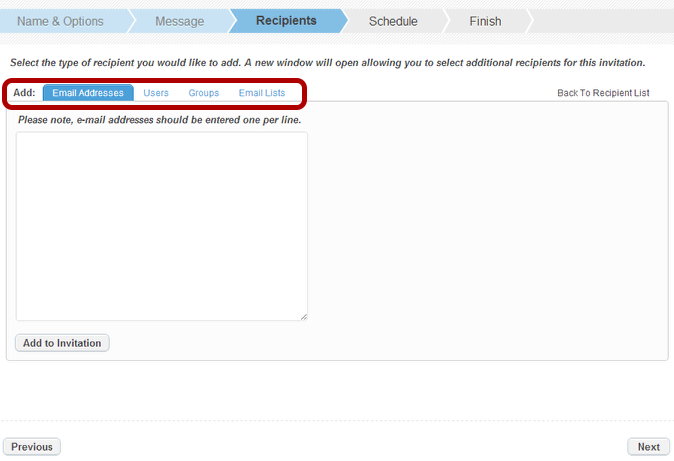 From the Share Menu on either the Survey Dashboard or Survey Editor, choose Email Invitations -> +Email Invitation. This will take you to the Invitation Wizard. Or, if you’d prefer, you can also reach the Invitation Wizard by choosing Share -> Launch, following the prompts, then clicking the Email Invitations button when you get to the Share step. Add an Invitation Name. 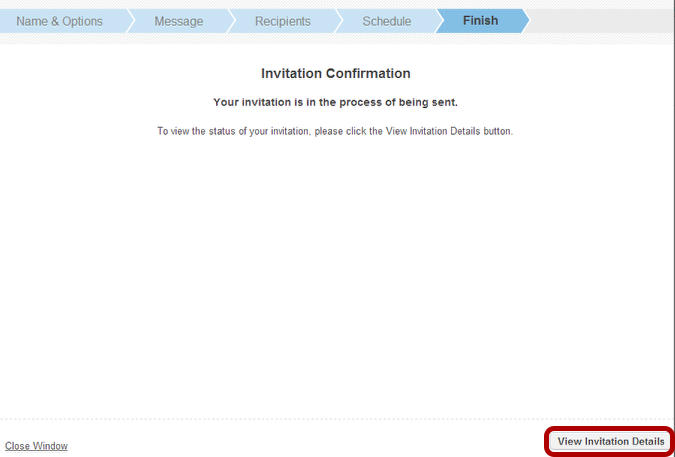 The Invitation Name is only visible to admins within the Checkbox application to help you identify the invitation. Either create Blank invitation or Copy the message and subject from an existing invitation. Determine whether you wish to format your email in Text or HTML (HTML is recommended). Enable “Allow embedded survey link to Automatically log users in” if you don’t want your registered Checkbox users to have to manually enter their usernames and passwords. Enabling this option will create a unique link for each user so that they are automatically logged into the invitation when they click the link, thus associating each response with a username. *Note that this option only applies if you are sending your invitation to registered users and does not apply if you are using Email Lists or are just copying and pasting email addresses into your invitation. Enter the From Email Address, From Name, and Subject of your invitation. Enter your invitation message in the text box provided. Use the HTML options to customize fonts, add images, and further brand your invitation. Within the subject and message text fields you have the ability to Merge in user profile attributes, such as FirstName and CompanyName, using the merging drop-down below the text boxes. Note that merging of User Profile Properties will only work if you are sending your invitation to registered Checkbox Users (versus just email addresses). NOTE: Be extra careful when modifying the “Click here” link, as it contains the code to track your respondent. If you have any questions about how to safely modify this link, please contact support prior to sending your invitation. TIP: If you want to be able to personalize your invitation or survey with custom user profile information, you need to add Users and/or Groups to your invitation. After entering/selecting your recipients, make sure to select the Add to Invitation button to add the recipients to your email list. If you are satisfied with your list, select Next to schedule the invitation. If you wish to modify the email message or email name/options, select Previous. Send the invitation as soon as possible. The email will be queued to send as soon as you select Finish. Schedule the Invitation for a specific date and time. If this option is selected, click into the text field to view a date/time picker. Save the invitation as a draft for later sending or scheduling. You may also send yourself a test email invitation by entering your email address into the E-mail field and clicking Send Test E-mail. 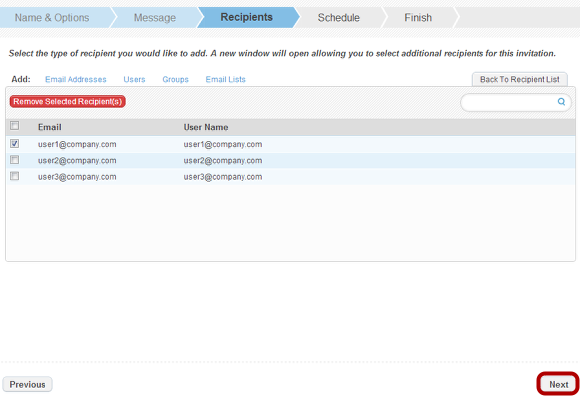 Once you are satisfied with your email, recipients and scheduling configuration, select Finish. Depending on the scheduling option you selected on the previous step, you will see different confirmation messaging and options on the Finish step. If you’d like to edit your invitation or schedule, send or schedule reminders, or view the invitation status or recipients, click the Invitation Details button to open the Invitation Manager. Scheduled email invitations are stored as pending invitations and can be modified up until the point that they are quqed for sending. 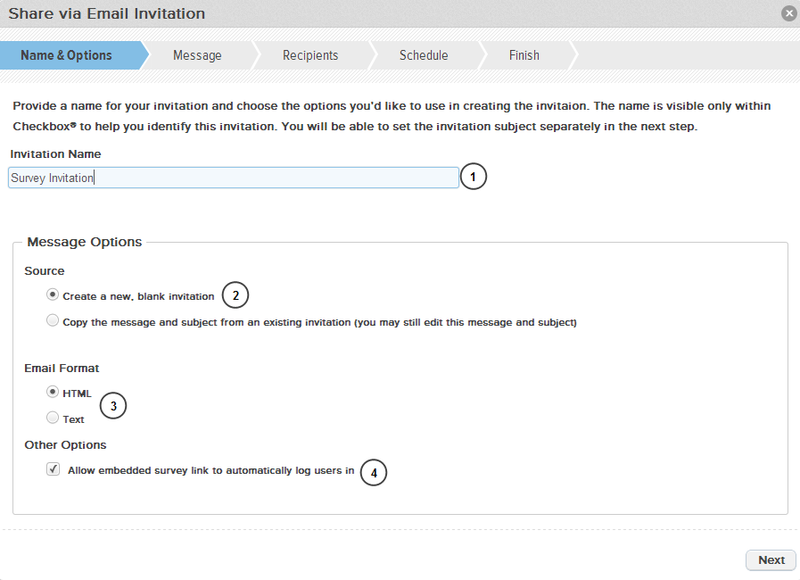 To modify your invitation schedule, use the View Invitation Details in the step above or click Share -> Email Invitations -> Manage Invitations. To edit a scheduled invitation, select it to open the invitation details. 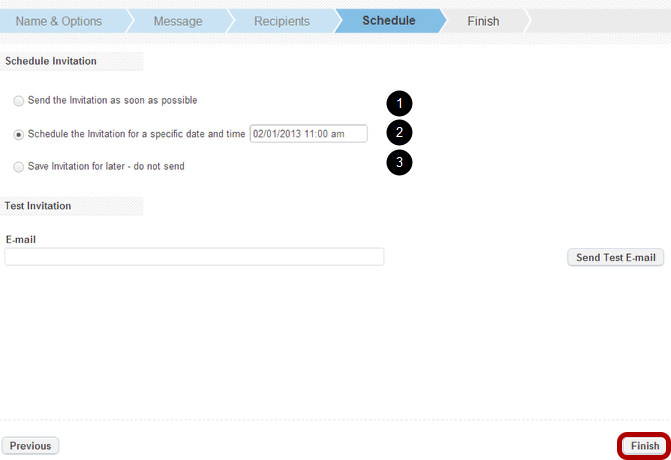 Then select View/Edit Schedule from the Invitation Actions button and use the date picker to edit your invitation time.